These days, every day is a storm. Of sunlight, the kind that pierces our eyes with brightness, or of rain. The kind that comes down sideways, fills up gum boots and then pools in the garden turning the last greens into limp lily pads. This is the transition from one season to next, there is no determinable line, but instead a process that is marked as the leaves fall to the ground and then ice forms on the marshes. These seasonal transitions are often times when our bodies have the lowest resilience to colds and flus. New viruses come around and when our immunity is down, they get in. Keeping your immune system strong can be a basic way of life and doesn’t need to involve expensive herbs or products. First off is the importance of getting enough sleep. As most of us know, sleep is when our bodies do needed repair and it is also when our immune systems are most active. While we have the grace of long nights, try to take advantage of them and sleep at least eight hours. A helpful way to wind down for an early bed time, is to limit any screen time an hour before bed. The light from the screens confuses our hypothalamus, that gland that governs our internal sleep cycle. Also, try a tea of chamomile and lavender after dinner. It both helps with digestion and calms the nervous system. Aside from enough sleep, our diet is a an easy way to incorporate immune enhancement into our daily lives. Food such as garlic and onions, especially when consumed raw, are excellent as anti-microbial, anti-viral and anti-biotics. Hot peppers, and most aromatic spices like ginger, turmeric, black pepper, cloves, cinnamon, sage, rosemary, thyme and oregano are also wonderful for keeping our sickness. Hence the healing benefits of old fashioned chicken soup. A broth made from bones is also deeply nourishing. When cooking for health, add liberal amounts of herbs and spices to your dishes, maybe more then you do other times of year. Be sure the products you use are properly dried, non-irritated or fresh so that there are still active compounds in them. Adding in fermented foods to your diet will also help, as a large part of our immune response happens in the gut. Soup with a miso broth is nice to warm up with in winter. Non-pasteurized sauerkraut is a great way to get many different pro-biotics and goes well with heavier winter foods. I tend to stay away from dairy, even when fermented during the cold, damp months because according to Traditional Chinese Medicine, it is a cold, damp food and can create more mucus. When it comes to herbs, Reshi and astragulus are wonderful for boosting and supporting your immune system, increasing white blood cells, which are those active in defense of infection. I suggest taking these as a tea or tincture throughout the winter. They are also both what is called adaptogenic herbs, which means they help the body deal with stress and can be uplifting. Colds, flus and coughs are complicated matters. There are many wonderful herbs that are specific to each symptom, stage of illness and virus, too many to detail here. Some favorites though are yarrow flower, elder flower, peppermint and ginger drank as a hot tea in a hot bath and then again wrapped in many blankets to promote sweating and break a fever. For coughs I love honey mixed with elecampane, marshmallow and Oregon grape tinctures, taken as a syrup. And for colds lots of garlic, chamomile and calendula tea and lots of quality vitamin C. Above all, rest rest rest and drink lots of water or herbal tea to flush out your system! My Yard is a Salad! I just came in from the garden, and even though my salad greens are not ready, I have a lovely looking salad ready to eat! There are many wonderful plants that grow without being asked, and although some call them weeds, I call them salad! Spring is an abundant time of year for dainty, edible greens, just what our bodies crave after a long winter of heavy foods and limited fresh vegetables. Today, my salad has a greens mix you would be hard pressed to find in a grocery store. It contains sheep sorrel, chickweed, miners lettuce, ox eye daisy, cleavers, dandelions and braised nettle tops. Sheep sorrel (rumex acetosella) is a tart, lemony flavored green that adds a nice zing to a salad. The great thing about sheep sorrel is that it is also amazingly high in vitamin C and A, and as a result, it is an ingredient in the traditional Essiac Formula used as a preventative and treatment for cancer. Some of the many traditional uses of the leaves are to help heal sores in the mouth, as poultices for drawing out toxins and are important for removing heavy metals from the body. Although favorite food for our chickens, we also are happy to eat chickweed (stelleria media), stem and all, before it flowers in the spring. It has a refreshing taste, similar to spinach, with some of the same compounds and vitamin C and A content. 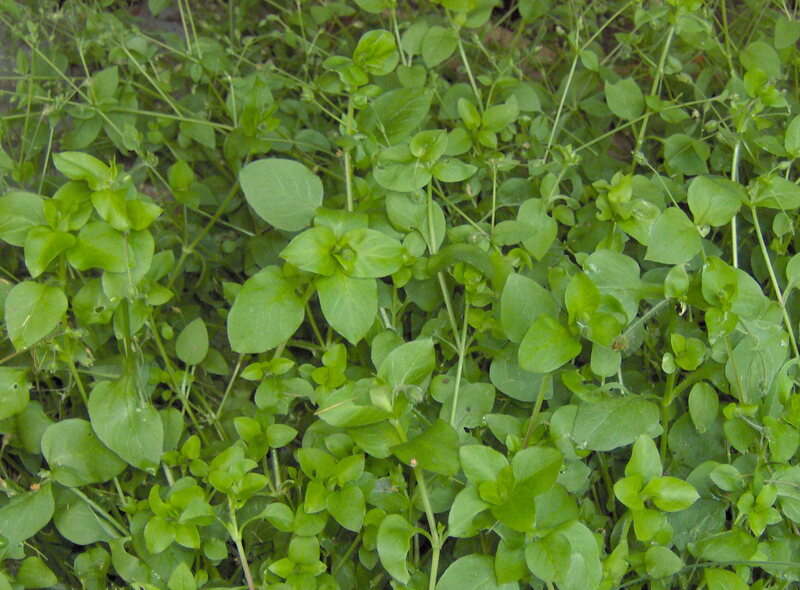 Chickweed is also a commonly used herb, especially in first aid applications. The leaves chewed or mashed up are a cooling poultice to sun burns, burns, bites and stings. For hot eczema and dry psoriasis a salve or cream with chickweed are unbeatable both for its soothing and healing qualities. Chickweed is a great plant to introduce to children as a snack they can munch while playing out doors and to help their bumps, bites or burns. Miner’s lettuce (claytonia sibirica) has a similar flavour and coolness to chickweed and it’s larger leaves make it an accessible green to add to salads. Ox eye daisy (leucanthemum vulgare) is a commonly recognized summer flower, but its edible leaves with a slight vanilla flavour are often forgotten as a green in the spring. You can also add finally chopped early shoots and stalks to your salads. When the flowers are out, you can sprinkle the white petals on the salad to add some finery. The flowers can also be used in a tea as a gentle nervine similar to chamomile and are helpful for reducing inflammation and stomachaches. Also called Bedstraw, Cleavers (gallium spp.) are better as a medicine then a salad green because of their Velcro like stems, but are fine to eat if chopped finely. Again, this green is high in vitamin C, and helpful for “spring cleaning”in the body. Cleavers also assists with lymph cleansing, there bye strengthening the bodies ability to cleanse the blood. Cleavers can be used similarly as chickweed for its cooling healing properties. As a slight diuretic, cleavers can help to clear out urinary and kidney infections, lower blood pressure and reduce weight gain and edema. Dandelion (taraxacum offinale) was originally brought to North America from Europe as a salad green and what started as one persons garden has become one of the best known “weeds”of our time. The leaves are not very bitter when they are young and tender and even when they do grow a little bigger, they still offer a nice flavour in salads. We have taken to making dandelion Ceaser salads, as tasty way to have our medicine. The bitterness in the leaves helps activate the liver, which then aids in fat absorption, blood cleansing and hormone regulation. The leaves are also an effective diuretic, stronger then cleavers in its action on the kidneys and in reducing edema and swelling. Unlike many pharmaceutical dietetics that rob the body of potassium, dandelion leaves are actually a good source of potassium, along with vitamins C, A, E and B-complex, iron and calcium! While a whole book could be written about the wonders of stinging nettle (urtica diotica), I will mention them briefly as an addition to salad. Because they contain formic acid, the same compound that gives ants their bite, nettles are difficult to eat raw. Difficult, but not impossible. If the stinging hairs are crushed, bent, or heated they loose their sting. So, to eat them raw, you can roll them with a rolling pin (which is a little labour intensive), blend them in a juicer or blender, or rub them vigorously between clean tea towels. Or, you can lightly steam them and add them chopped into a salad. Nettles are %10 protein and are high in iron, calcium, vitamin C and a whole host of minerals! So although picking these greens may seem tedious, they are worth the time to give your body a super nutrient packed salad like none you will find in the grocery store! By now, signs of spring are emerging almost everywhere on the West Coast. Frogs are chirping, birds are back from their winter migrations and new growth is bursting forth from plants and trees alike. Many people are also feeling this awakening with longer days and more energy. Now is a great time to be feeding our bodies wild and nutritious foods, to help shed the excess that we may be carrying from the winter and to welcome more energy into our bodies. There are many exciting plants that we can use for food and medicine at this time of year. Some of them are things we may have never thought to use, but grow abundantly on the coast, like the new green tips on Douglas fir needles. These needles are really high in vitamin C and can be nibbled on as you walk by, or collected and dried to add a nice tangy flavour to teas when you are feeling a cold or flu coming on. Before grocery stores, fir tips were an important source of vitamin C for many people, after a winter without fresh foods. Many of the spring foods are high in vitamin C, which helps boost the immune system, the anti-oxidants act as a de-rusting system in the body which combats early aging and infections. Young salmon berry shoots were once commonly eaten in the spring by coastal Indigenous people and are also high in vitamin C. If you cut them at the bottom of the bush and then peel them, you can eat them raw or, cut them up and steam or stir fry them to add a new spring vegetable to your diet. The beautiful pink flowers of the salmon berry are also edible, they taste like a sunny spring day might! Just don’t eat them all, or there will no berries later. Common cow parsnip is another much unused spring vegetable. Not to be confused with giant cow parsnip, which can cause uncomfortable skin eruptions, the tender new shoots of common cow parsnip can be peeled and used like celery, tasting quite similar. The roots of cow parsnip have many medicinal qualities, and has been used for tooth aches, to aid in the regrowth of nerves after damage and as a gentle analgesic. Be sure to carefully ID cow parsnip, as it could be confused with poison or water hemlock. Alder trees are almost ubiquitous on the west coast in damp areas or places that have been logged or old road ways. As the sap begins to flow in early spring, the tree sends its energy outward to its tips. These tips can be used in the spring as a lymph tonic, thus supporting the immune system and cleansing the blood. 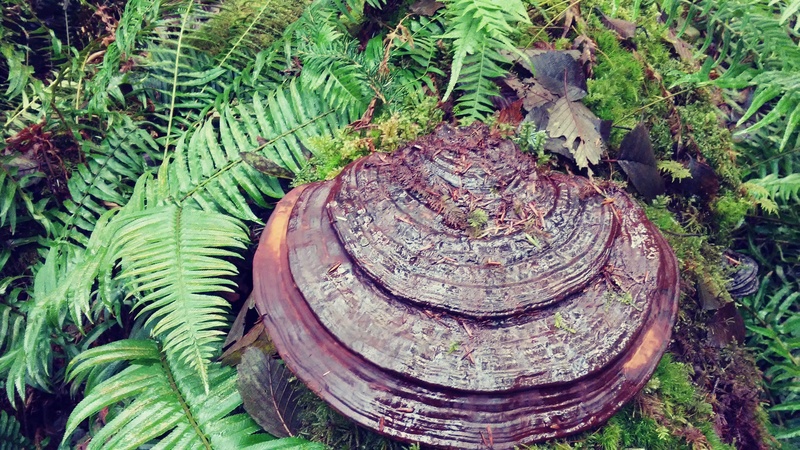 The inner bark is astringent and can be used as a wash for cuts, scrapes, bruises, and to tonify tissues. The catkins that hang down like little decorations in spring can be eaten, and although they are a little mealy, they are really high in protein. Spring is a time for flowers, and though they are often showy, some go unnoticed. Big leaf maple trees have a wonderful, often over looked, show of flowers that bees love. The flowers are a delicious snack plucked right from the tree, or they can be steam or stir fried into food, giving it an uplifting, slightly flowery taste. These flowers are also high in vitamin C and are helpful in creating an anti-histamine response, perfect for spring time allergies! Related to the sugar maples of the east that we get maple syrup from, big leaf maples have a sugar content in their sap as well. Tapping big leaf maples for their syrup is becoming popular these days, and aside from making delicious syrup, the sap water is high in manganese, zinc and many other trace minerals. Spring on the coast wouldn’t be complete without the sweet, bees-wax like smell of the black cotton wood trees that grow along river banks. Before the trees leaf out, they make sticky, resinous buds that smell like you might want to eat them. These buds make amazing medicine, either in the form of oils, salves or tinctures. Topically, Balm of Gilead, is warming, brings blood to the surface of the skin, reducing inflammation and swelling. This can be helpful for reducing pain from arthritis, sports injuries, and sprains and bruises. Internally, the tincture can be helpful for colds, coughs and flus, by coating the mucus membranes in the sinuses, throat and lungs. This season is abound with amazing medicine and food (what’s the difference anyway?!). It is a great time of year to learn more plants in your neighbourhood that can add to you and your families health! Early spring is a great time to learn about roots. This is time of year when our bodies are transitioning from winter to spring. In winter our diets often include more fats, starches, sweets and alcohol prevalent at our holiday meals. As the days grow longer we begin to get more active, our blood starts to flow and our livers and digestive systems wake up. Roots are a great way to help our bodies deal with the excesses of winter and strengthen our systems to support the cleansing time that spring will bring! Oregon grape (Mahonia spp. ), Dandelion (Taraxacum offinalias), Yellow Dock (Rumex crispus) and Burdock (Arctium lappa) are four healing roots you may have walked by a thousand times without knowing it! They grow abundantly on the west coast and are often seen as weeds. With a little prior knowledge they are easily and best harvested between late October and early March when the energy of the plants is still below the ground. Once dug up use a stiff brush to clean away the soil and cut up to dry or make into further medicine. To make a tea, use about a tea spoon of finely chopped dried root per cup of water and let simmer at least 10 minutes. These roots all share a bitter quality that activates the liver, thus helping the liver break down fats, toxins and process hormones. They aid in relieving constipation and cleanse the blood thus encouraging healthy skin. Oregon Grape aids in combating bacterial infections internally, when you start feeling some sickness coming on, or externally for things like staph infections. Dandelion root is helpful for the liver to process toxins, whether from alcohol or drug use, exposure to pollutants or in reaction to allergies. The root and the leaves are reliable diuretics and help reduce inflammation in the kidneys. Yellow Dock is often used for constipation that results from dietary imbalances. Burdock, or Yellow Dock used with Red Clover is an old remedy used to help skin eruptions and as a blood cleanser. Great for helping clear up teen age acne, zits related to PMS, eczema or psoriasis. Burdock is also a gentle adaptogen, helping the body to regulate and deal with stress. Getting to know some local roots can be great for your health! Take a walk, get your blood moving and smell the first signs of spring on the air. Then go home and drink your bitter tea.